Web advertisements haven’t quite kept up with the web’s shift to responsive design. Mobile ads exist, yes, but they exist as separate entities from desktop ads. 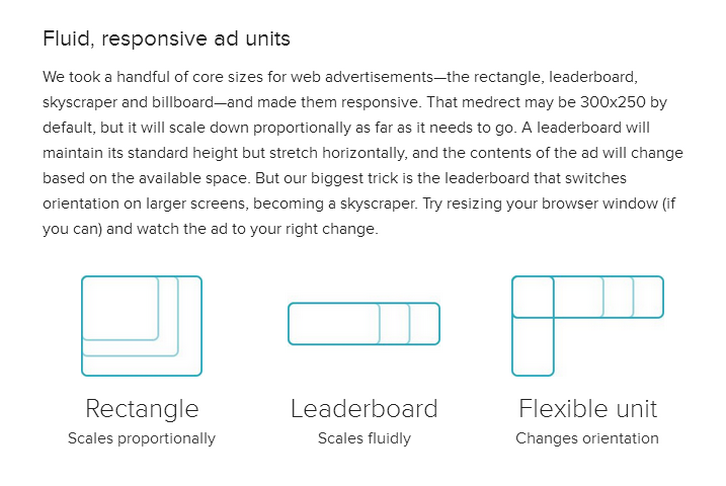 A campaign may include a handful of ads that work on set screen sizes, but they aren’t truly fluid and responsive. ZURB has prototyped an implementation of responsive ads that’s completely fluid, lightweight, and built using web standards. Because they’re just embedded webpages, editing content is as easy as firing up a text editor. Styles, scripts and all, our ads average about 15K in size, while still being fully animated. And best of all, an ad server need not determine what ad to send to the client based on the device—one ad will work on any screen.